This remake keeps the 1980s era of the original setting and it works beautifully. Not trapped by technology, it allows the story to just flow more organically but most importantly it keeps things scary. Not only is it scary but it induces that real pit of the stomach dread, which is quite some feat because there is not really anything new in the film that hasn't been seen before. There are (or aren't) vengeful spirits, devil worshippers or the like but everything is built on, tension block upon tension block. Yes, there are your typical jump scares but it is the lead up and then the after effects of the scare that is where the real horror resides, the simple act of someone screaming off screen is enough to run a chill through you. The acting is good all round but the child actors really sell this film, they are fantastic. Bringing humour when needed and when they are frightened it is very believable. The smallest child Ian (A great performance from Adhiyat) is deaf and communicates through sign language - which is used to terrifying effect in the film. 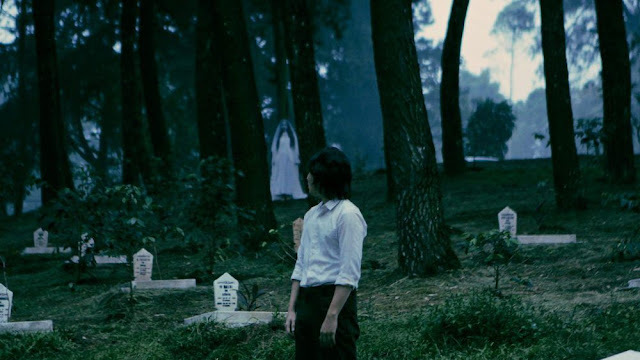 Writer & Director Joko Anwar knows what he is doing slowly crafting a spookfest and a haunted house ride. With each scene he ratchets the tension up a few clicks, then a few more until you are hyper aware but still unsure of just what will happen next. Ical Tanjung's cinematography is tremendous, keeping the washed out colours, shadow and light all working in perfect a union. The film isn't perfect and certainly has problems, some convenient plotting and slightly under explored ideas but it isn't something that will detract from your viewing experience. Alot of the time horror films rise or dive on the ending and Satan's Slaves certainly has a strong ending but it won't be for everyone, however when broken down it is a thoroughly brutal heartbreaker and for me it worked not only as a gut punch but something that made perfect sense with regards to the plot. Satan's Slaves is atmospheric, creepy and just plain scary. Anwar uses every trick in the book to get under your skin and does just that, in a just world Satan's Slaves would be internationally celebrated and I hope that happens. Hands down the scariest film I have seen this year.